This is amazing! What beautiful images. I wonder how she managed to get permission to take these photos and display them publicly--usually museums don't like their innards and attics exposed! i think that is mean to do. its horrible!!! It's not mean. 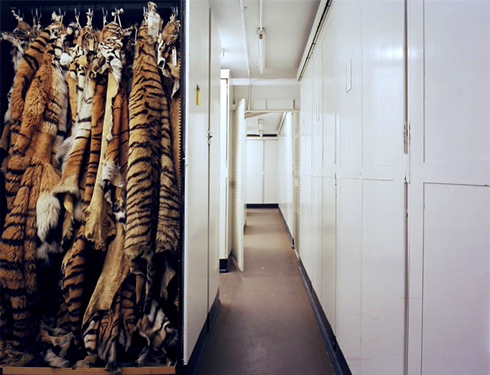 If 1,000 total people donated a single "tiger skin rug" each over the course of 100 years (10 per year from the millions of people in the U.S., or from the billions in the world; each possiblly being kept poorly in a house attic from an ancestor), should they store them properly (although without individual rooms for each item) or should they turn items away to maybe get burned, sold or ruined? It's nice that the museum even has room in this manner for to accept all the donations they get. But what's the use of having so many extra skins. In the end, it looks like the demise of the skin is the same -- whether in the attic or in the museum's closet. Neither are ever used. One is preserved well, but never used.